When properly trained, your pup can be one of the very best training partners you can find. But it’s not as simple as leading Fido out the door and hoping he’ll follow along. Just like their human companions, dogs require conditioning and build up before they can handle a running program. Dr. Jamie Fleming, an internal medicine specialist with Lakeshore Veterinary Specialists and Performance Running Outfitters team member, provides tips for running safely with your pup so you both enjoy the miles. With the warmer temps, more runners are bringing their pups with them for a run. What are some things people should keep in mind before leashing up? Remember… your dog is much like you in terms of conditioning, both for distance and for heat/humidity. Just like you wouldn’t set out to run 3 miles with no build up, your companion needs to be conditioned to run any substantial distance (really anything over a mile or so). Imagine a canine version of “Couch to 5K”. If it’s humid or above 75 degrees, make sure to have water available for your pooch, as the risk of heat exposure/heat exhaustion is a serious threat at warmer temperatures – or even cooler temperatures with high humidity. Can all dogs go for a run? Or are there certain types/breeds that should stick with walking? Obviously, the more sporting breeds (labs, retrievers, pointers, etc.) are better suited to running compared to some of our smaller breed friends. In general, before introducing a running plan, if your companion has never run with you before, it’s always a great idea to check with your veterinarian to ensure that there are no health concerns that might make walking a safer/healthier option. In general, breeds with a short snout (called brachycephalic breeds, like the bulldog) should exercise with caution due to their limited ability to cool effectively. What distances are safe for dogs to run? What about paces? Just like you, with proper conditioning, there are no absolute rules/restrictions when it comes to distance or pace. Often, our dogs are comfortable at paces much quicker than their human companions. 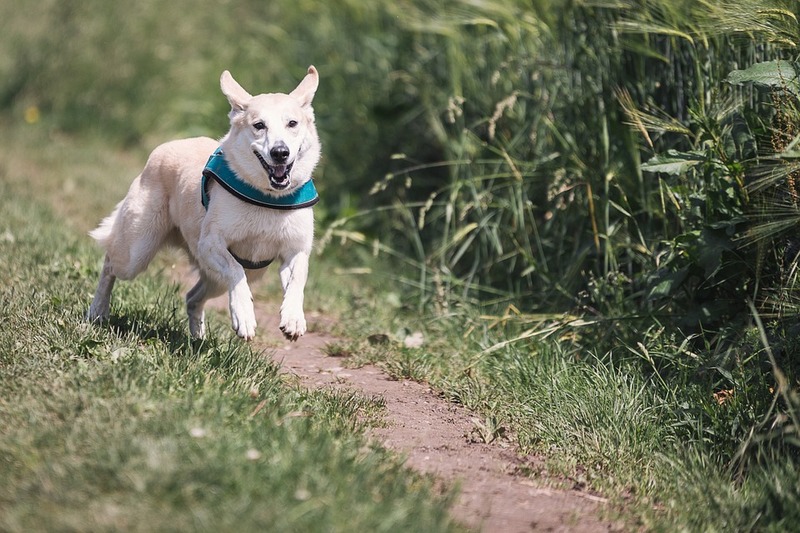 A good rule of thumb is gradually building into any sort of distance (again, anything over ½ to 1 mile should require some build-up) to make sure your pet is able to run comfortably next to you as you increase the distance over time. If you notice your 4-legged friend is lagging behind, or taking longer to recover, this might be a sign that he/she is being pushed too hard. Again, consulting your veterinarian if you have specific questions or concerns about your dog and longer distances is always a good idea. Are there any weather conditions that might be dangerous for pups to go for a run? I would be cautious about running any sort of distance in humid climates and as the temperature rises over the summer months. With the warmer and more humid weather, making sure you are choosing cooler times of day, such as early morning and late evening, will help to minimize the risk of heat stroke. Dogs are significantly affected by the heat and humidity, as they do not sweat/perspire through their skin, like we do. Instead, they exchange heat/cool themselves by panting, which means they cool their entire body through a very small surface. Imagine how difficult it would be for us to cool off, if we didn’t sweat and use our skin for heat exchange! Are there any rules for pup hydration? What about diet – should people avoid feeding their dog right before going for a run? In terms of hydration, a good rule of thumb is that if you are warm/thirsty, your dog probably is too. Whether hanging out in the heat or going for a run, anticipate your dog’s water needs by carrying a portable water bottle/drinking bowl. If your dog likes to swim, running near a clean/safe water source is always a great way to ensure they stay cool and hydrated, too. 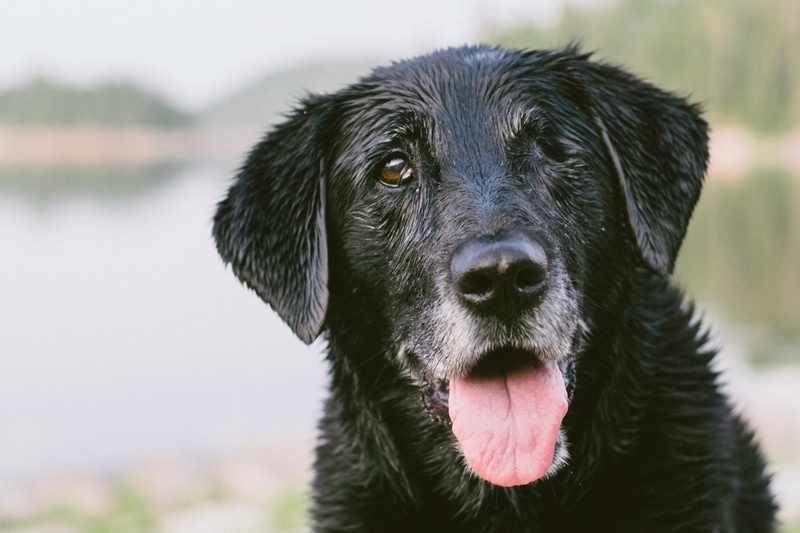 Figuring out your dog’s hydration needs is a part of the build-up and conditioning – some dogs will finish a run and dive into the water bowl and others are more gradual. You do not need to use Gatorade or other electrolyte supplements; however, if going on a lengthy hike, your dog might appreciate a dog friendly snack, just like us humans do! It is always easier to stay ahead of hydration needs than to deal with the serious consequences that our dogs can suffer when they become dehydrated and overheated. In general, I recommend against feeding prior to a run, although research has not linked this to any significant issues. Some veterinarians do feel that running on a full stomach can increase the risk of bloat (gastric dilatation volvulus). A small snack is probably sufficient for a light to moderate run. Why are leashes important – even if your dog is friendly? As part of a veterinary team that deals with the daily consequences of “good dogs” being hit by cars or getting into fights with other dogs, leashing your dog is a MUST. Even if your dog is the model by which all dogs should be judged, if another dog misbehaves, the leash is also a way to pull your dog into safety and away from the aggressor. What about dogs that haven’t gone on a run before – do you have any tips to help people get started with running with a dog? First, start with walking. Make sure your dog is comfortable heeling next to you and not pulling you over, tripping you, or dodging in all directions. Once you and your dog are comfortable at a walk, you can try jogging – again, keep in mind conditioning and start with distances around ½ to 1 mile. Also, consider rewarding your dog’s good behavior. Any other tips to help people run safely with their dog? Remember, that if your dog runs too far without proper conditioning, or the ground is really hot, they can damage their footpads, resulting in significant pain and discomfort (burns, tears, etc.). Again, by heading out in the cooler times of the day and following proper conditioning, this should help to minimize the risk. If you do use booties, proper fit is vital (just like our running shoes!) and make sure to evaluate for any rubbing or damage after your run. Booties might be indicated to help protect against abrasions on rough or hot pavement, on rocky hiking trips, and during the winter in the extreme cold and ice. With the humidity and heat – when in doubt, keep the runs short, take your dog out early or later in the cooler temperatures, and remember that you have to look out for your dog, as they will run from the heart to keep up with their human companion (and not look out for their own needs). This entry was posted in Running Resources and tagged Dr. Jamie Fleming Klose, Lakeshore Veterinary Specialists, Running in MKE, Running With a Dog. Bookmark the permalink.